Honeybees are getting an awful lot of attention these days. People from all walks of life are losing their fear of bees, and learning about these incredible little critters. Beekeeping is, therefore, exploding onto the hobby scene. An industry that once catered to a treasured few can now offer products like the Brushy Mountain Bee Farm English Garden Hive Beginner’s Kit to just about anyone. Beekeeping is a fascinating hobby. Not only do you get to engage with one of nature's miracles, but you also get the bonus of helping save the environment. Concern for bees, in general, has increased awareness of harmful pesticides. It has moved people to demand more open spaces full of natural grasses and wildflowers. Plus, there's all that free honey and wax! What Is The Brushy Mountain Bee Farm English Garden Hive Beginner’s Kit? To understand beehives and beginner kits, you first must understand basic beekeeping. Beekeepers, also known as apiarists, actually do very little. Your bees will thank you for leaving them alone and only disturbing them when you have to. That makes products like the Brushy Mountain Bee Farm English Garden Hive Beginner’s Kit even more appealing. The hive itself is an "English Garden Hive." It's a distinct style with a gable roof, typically covered in copper. The boxes themselves are made of cypress. They hold eight frames each for honey harvesting. Although the boxes come unfinished, they are paintable with standard latex paint. Non-toxic, waterbased stains are also bee-friendly. The Brushy Mountain Bee Farm English Garden Hive Beginner’s Kit offers much more than a pretty hive for your garden. The frames are wooden "superframes" with plastic foundations. They make creating honeycomb easier for your bees and harvesting easier on you. The bottom of the hive is a stainless steel mesh that allows airflow and helps keep your hive free from mites and other parasites. Brushy Mountain also includes a hatless veil and plastic coated gloves, along with a smoker and fuel. Apiarists have their tools. These are among the most basic. Interacting with your bees without them is something nobody recommends. Upgrades to the safety items are available when you purchase a kit. There are several other items included with the Brushy Mountain Bee Farm English Garden Hive Beginner’s Kit. An entrance reducer and feeder, handy bee brush, and standard 10-inch hive tool round out the package, giving you the basics to start a colony in your backyard. Beekeeping has a range of prices for beginners from too-good-to-be-true to absolutely ridiculous. As the hobby and knowledge of bees spreads, however, the market will correct itself to offer the beginner the right products at the right price. The Brushy Mountain Bee Farm English Garden Hive Beginner’s Kit does just that. With prices ranging from $320 to $370, this hive won't put you into bankruptcy. The discerning homeowner who wants a hive that will be both functionally and aesthetically pleasing will love this setup. Be forewarned, however, that if you expect to harvest and use raw honey and beeswax, you'll need to spend money on the equipment for it. Is the Brushy Mountain Bee Farm English Garden Hive Beginner’s Kit the Only Option? Definitely not. The bee supply market offers a bunch of beginner kits for the eager new apiarist. Your beekeeping experience can be as expensive as you want it to be. Knowing your options, therefore, is always a great idea. IDEAL FOR A BEGINNING HOBBIES. Williams Sonoma is good at offering a product everyone wants, but nobody can use practically. Their Backyard Beehive is no different. While it is available for sale, the original manufacturer is no longer in business. That may not be an issue for people who bought boxes and frames in standard sizes, that won't be the case here. The frames on the supers are a smaller or different sized from all others. Finding replacements, therefore, becomes an expensive mess not worth sorting out. And yet, that isn't the only issue with this Williams Sonoma hive. The base is solid wood, which is a no-no in the apiary world. Mesh bases allow airflow and help keep your bees free from mites and other parasites. As you can see, the package is nearly identical. At a price point $$$-$$$ higher, however, the value just isn't there. 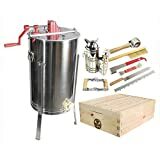 A great kit to consider as a beginner beekeeper. The Goodland Starter kit isn't in the same category as an English Garden Hive. 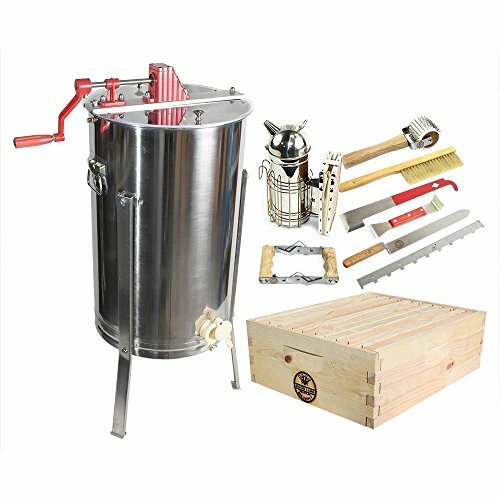 It is, however, a great kit to consider as a beginner beekeeper. While the Brushy Mountain Bee Farm English Garden Hive Beginner’s Kit focuses on the look of the hive, the Goodland kit focuses on the honey. Included with this system is a honey extractor that will round out any beekeeping experience. Beginner beekeepers who spend their money on a nice hive may not be thinking about how they'll harvest their honey. The hand-cranked extractor spins your frames, using centrifugal force to send the honey flying from its combs. Once extracted, your frames are returned to the hive where they'll be licked clean and repaired by the workers. The business of filling them with sweet honey then begins again. The other common method for extracting honey won't require an extractor, but you will have to apologize to your bees. It's called "smash and strain," and it is exactly what it sounds like. The honeycombs are cut from the frames and smashed to bits along with the honey. The gooey liquid then drains through a filter to result in clean, raw honey. It does not include a hat, veil or gloves. At a price point between $$$-$$$, the value is there for those who decide to toss aesthetics to the wind. Flow Frame technology is the most significant advancement in beekeeping since 1852. Honeyflow.com is the home of Flow, a revolutionary system of beekeeping that turns the hive itself into a honey harvesting machine. Flow hives are expensive, and with good reason. Not only are they beautiful to look at, but they're also incredibly efficient. Flow hives are the invention of a father and son team out of Australia. They've developed a patented product that allows even the most novice of apiarists to be successful. There really is no way to compare any Flow product with the Brushy Mountain Bee Farm English Garden Hive Beginner’s Kit. With low-end price points starting around $$$, Flow systems are the sportscar everyone wants, but not many can afford. That's not to say it's overpriced. It isn't. 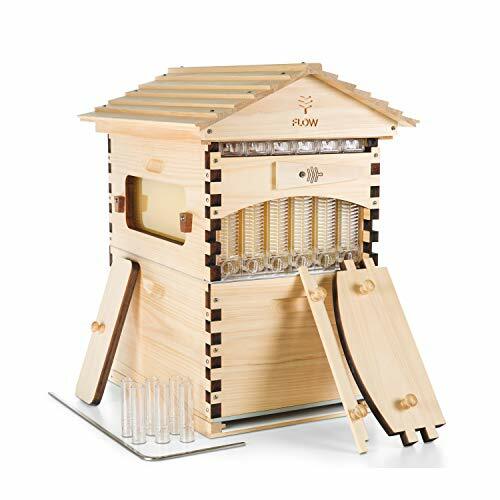 Flow combines a gorgeous apiary with a harvesting system that allows your bees to live long, healthy lives. They are both aesthetically pleasing and environmentally friendly. In a bee-friendly future, all homes will have a Flow system, the planet will be safer, and high fructose corn syrup will be a thing of the past. Flow may not be the right solution for someone looking for an English Garden hive, but it is without a doubt the wave of the beekeeping future. There's a lot to learn about beekeeping. There are a ton of different hives, frames, suits and extraction equipment to consider. The Brushy Mountain Bee Farm English Garden Hive Beginner’s Kit Has a lot to offer. It also leaves a lot to be desired. The hive itself is beautiful. The natural look of the cypress combined with the copper roof will make any English Garden -- or any garden at all for that matter -- an environmentally friendly delight. The boxes can also be painted or stained with water-based, non-toxic products, making the unit even more versatile as a showpiece. The hive is also very functional. Complete with a stainless mesh bottom, superframes with plastic foundations and the safety equipment needed to interact with your bees, the Brushy Mountain system is a great apiary. With proper care and winter preparation, your colony will flourish for years to come. At a moderate price point of between $$$ and $$$, The Brushy Mountain English Garden Hive won't break the bank. There are many less expensive ways to get into beekeeping. If you're looking for a functional hive with this particular look, however, you've found the right kit. The veil and gloves included are decent, but not exactly high-grade. Brushy Mountain does offer an upgrade to a cowhide glove and a nicer veil, but it will cost you. You're better off buying a complete suit with gloves and being done with it. You don't want to mess around with safety. The Brushy Mountain Bee Farm English Garden Hive Beginner’s Kit offers a great hive and functional safety equipment. It does not, unfortunately, focus at all on the honey. Your English Garden hive, when used for its intended purpose, will produce a large amount of golden, gooey goodness. Harvesting honey is inexpensive with crude equipment. If you decide to smash and strain, buckets, strainers, and mason jars will be the big-ticket items on your list. Be prepared to spend an afternoon covered in honey. It's not hard work, but it's messy. The great news? It smells fantastic.
. Your bees will thank you for saving them weeks of work. Beekeeping is a great hobby. For many, it's also a great business. More than anything, however, beekeeping is important. Humans aren't as sustainable as a species without the honeybee. It really is that simple. We occupy too much land and require too much food. Without pollination specifically from honey bees, a dozen or more essential crops to our very existence would disappear. Apiarists, therefore, take their bees very seriously. While there isn't a ton of actual physical labor involved, you still have to maintain a clean and healthy hive. Your bees are susceptible to mites and other parasites. Foreign invaders devastate entire hives. As a beekeeper, you'll have to commit to making sure these wonderful little creatures have everything they require to do nature's bidding. That requires weekly trips to the hive for inspection and monthly cleaning. Winter preparations will involve installing any bottom boards and insulation and moving your hive to a safe location out of the wind. Your bees will survive the coldest of winters by rubbing their wings together, creating friction. In the spring, the hive will set out to do what they do best and fill your jars with honey. A moderately-priced hobby that produces free honey and wax and helps save the environment? Who doesn't want to be a part of that? The Brushy Mountain Bee Farm English Garden Hive Beginner’s Kit will certainly get you on your way. It's a great kit for beginners, and it is priced well. Unfortunately, if you are focused on harvesting the honey, you are going to need to be extra tools with it. If you want to jump into beekeeping with both feet, however, you may want to consider a Flow hive instead. 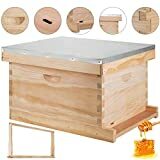 A Flow system is a lot more expensive than the Brushy Mountain Bee Farm English Garden Hive Beginner’s Kit, but it is a honey harvesting machine. Ultimately, what you decide to be will depend on what your goals are and how much you want to spend, but you can't go wrong with either of these.